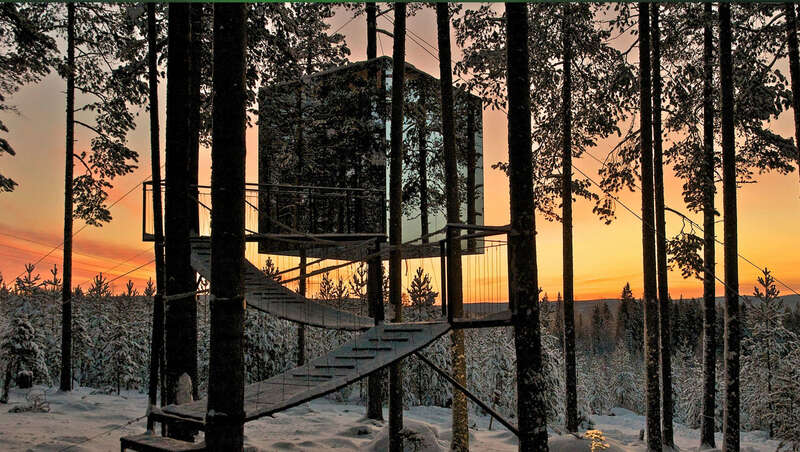 It might just be the world’s coolest hotel with individual tree houses offering comfortable stays to its guests. All located in the spectacular scenery of the forest of Swedish Lapland near the village of Harads. We take you behind the scenes as this location becomes the set for a high fashion photo-shoot for American Vouge! A team of no less than fourteen people under the lead of Executive Fashion Editor Phyllis Posnick arrived at the Treehotel in Harads in mid July. Their mission: to create an inspiring fashion story in a unique environment. Over five days there was intense activitiy as make-up artists, hair stylists, assistants and world famous photographer Patrick Demachelier worked their magic. The model for the shoot, supermodel Karlie Kloss who is also one of Victoria’s Secret Angels, also took the time to instagram parts of her experiences in Swedish Lapland to her one million followers. The team was very happy with their stay and enjoyed the hospitality and scenery. The finished piece of 12-14 pages will be featured in American Vouge, which is regarded as the world’s largest fashion magazine with an average readership of 11 million, in January 2015. And Karlie herself plan to return to Treehotel with her boyfriend. We offer her, and all other fashion lovers out there a very warm welcome to Swedish Lapland.